This is a section of Alexander Caulfield Anderson’s 1867 Map of the Colony of British Columbia, CM/F9, courtesy of Royal BC Museum, BC Archives. 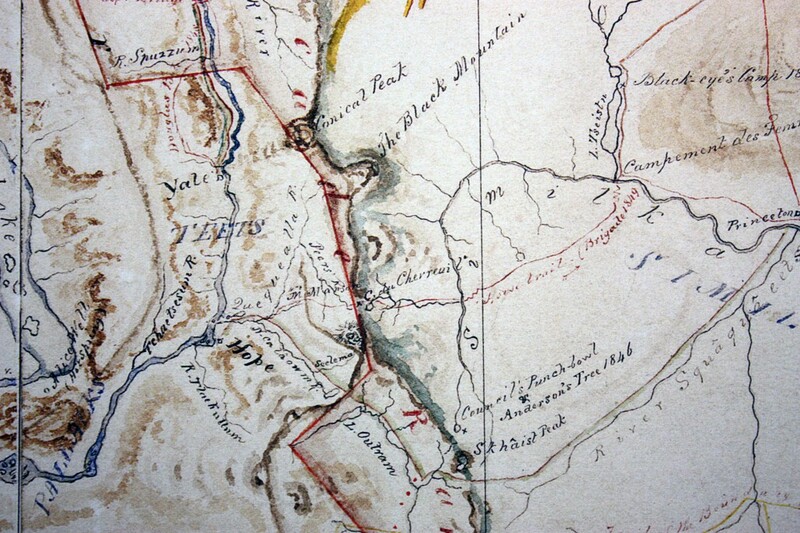 Detail of original map. On the lower right you will see Council’s Punchbowl Lake, and Anderson’s Tree. Anderson’s Tree is, of course, a Maypole Tree. In late May, 1846, Alexander Caulfield Anderson set out from Fort Langley on his return journey to Kamloops, across the range of mountains that separated Fort Langley from the interior post on Thompson’s River. He and his men were searching for a new brigade trail for the horses who would carry out the furs to Fort Langley, and return to the interior with the trade goods. It is interesting to note at this point that the Sto:lo men who accompanied Anderson were not entirely unfamiliar with this valley. 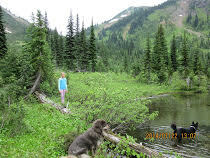 They knew the rivers to the south, such as the Skagit River. They even told Anderson that the Skagit led them to salt water (Puget Sound). They had been there! They were canoe people, who followed the rivers throughout their territory. Naturally, the Sto:lo would be tend to be disinterested in any trail that led up a mountainside! At the top of the hill, however, it appeared that all the work they had done that summer might be for naught: “A dreary prospect met the view. The whole surface of the valley, as well as of the confining mountains, was white with accumulated snow.” Anderson thought the heavily laden brigade horses could not travel through the deep snow that would lie here in the early summer. The Thompson’s River trapper had left them at the bottom of the trail, and most of the Sto:lo men turned back at the summit. Anderson and his men now had no guide familiar with the country and were forced to find their own way across the top of this plateau and down its north side. They hiked north for three hours through snow that lay three or four feet deep. For the most part the men walked on the snow’s frozen surface, but as the crust softened in the sun, travel became more difficult. At last, exhausted, they set up camp in a clear spot among the pines, on the banks of a creek that flowed from a little round lake Anderson named the Council’s Punch Bowl. In a map drawn more than 10 years later, Anderson indicated the position of Anderson’s Tree, which stood slightly southeast of the Council’s Punch Bowl. It is probable that Anderson’s Tree was the French Canadians’ maypole — a tree lopped of all its branches except for a puff of greenery at its top. Making a maypole to honour a man or a special occasion was a tradition among the French-Canadian voyageurs, and like all traditions it was done to inveigle a drink of rum from the gentlemen the tree honoured. On this occasion the voyageurs almost certainly succeeded in their goal. It was, after all, a historic moment: they had reached a height of land that no other fur trader had seen. I always wondered if Anderson’s Tree still existed, though I knew it could not be standing after one hundred and seventy years. I got my answer: These two images come to me from Kelley Cook, who explored Paradise Valley and Punchbowl Lake a few years ago with her niece, Ava. 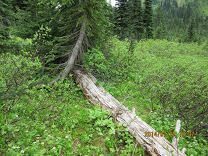 An avid historian interested in anything that has to do with the various explorations in this region, and the formation of the HBC brigade trail, Kelley found what appeared to be Anderson’s Tree, lying on the ground and decaying. She took these photographs. The tree shown here had once stood on the southeast corner of the lake, and Kelley said it looked as though its lower branches had been cut. As you see from the map above, it is quite likely that it was Anderson’s Tree. The second photo shows the tree where it has fallen into the lake itself. In the distance are the mountains that surround this region, and I presume we are looking west or north west toward the Fraser River and the Coquihalla range. And so Anderson’s Tree still lives, in its way, if in fact this is Anderson’s Tree. I wonder how long it lived; how long it stood as a snag, and when and how it fell. These are impossible questions to ask, of course, as no one can answer them. But we thank Kelley Cook for the images, and hope that the tree was a maypole tree. Copyright, Nancy Marguerite Anderson, 2016, (but the images belong to Kelley Cook, Princeton, B.C). All rights reserved.